Our emotional health and happiness are deeply connected to the aesthetics of the places in which we live. This idea runs at the core of the unique upside-down contemporary home we'll explore today. 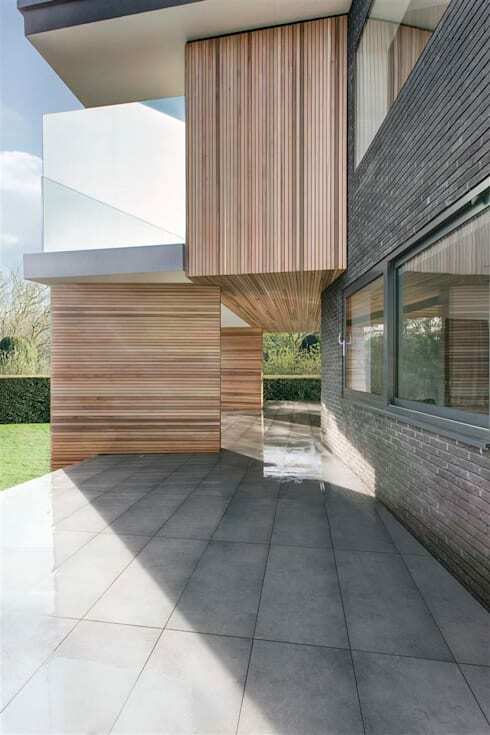 British architects, BR Design, were tasked with creating a new home for a couple who were mourning a deep personal loss. The couple wanted a new project in which to immerse themselves and begin envision a new path forward for their family. 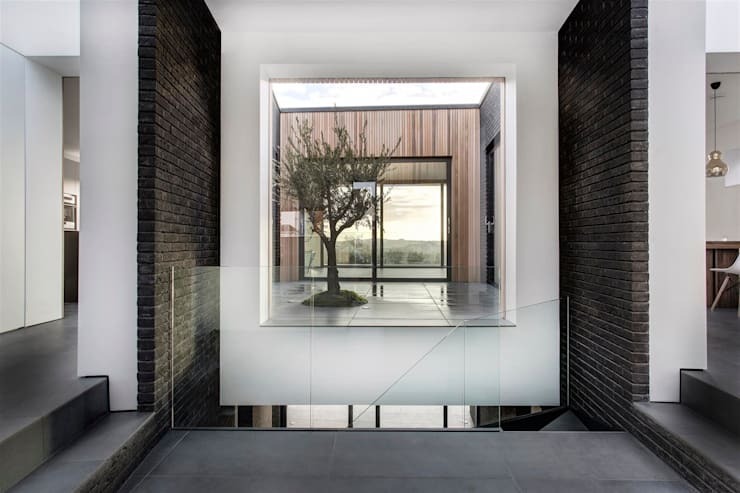 So after much research around the connection between good architecture and emotional health, the architects decided to focus the design around the 3 Ns: nature, natural light and natural air. Let's have a look at the incredible results! The exterior has a strikingly modern form with a raised entrance. 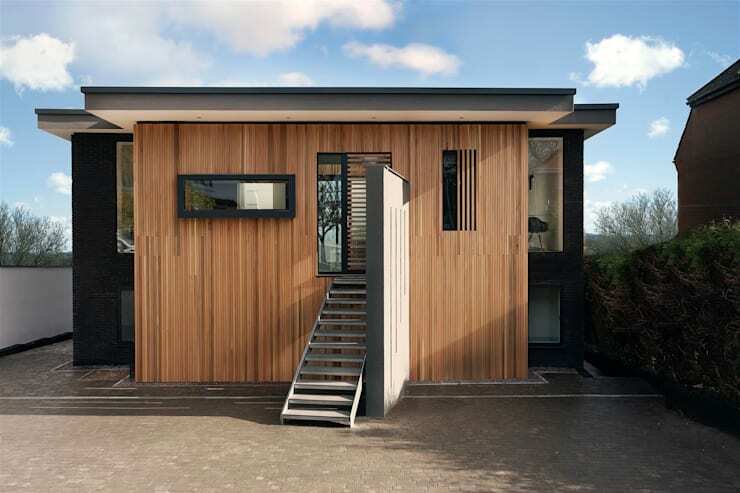 This, together with the fine vertical lines of the cedar cladding makes the exterior feel playful and slightly tree-like. The materials are all natural to promote a sense of calm and tranquility. The interior almost feels elusive within its cocoon of natural wood. 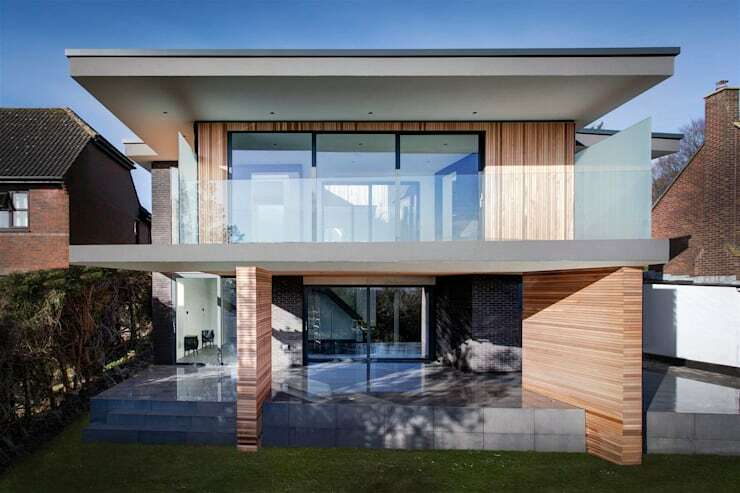 The home is organised as four interlocking boxes around a central open or negative space. This space, courtyard or inner garden, was inspired by Japanese Zen gardens. It has just a single olive tree at its heart. This feature is clearly the soul of the home. 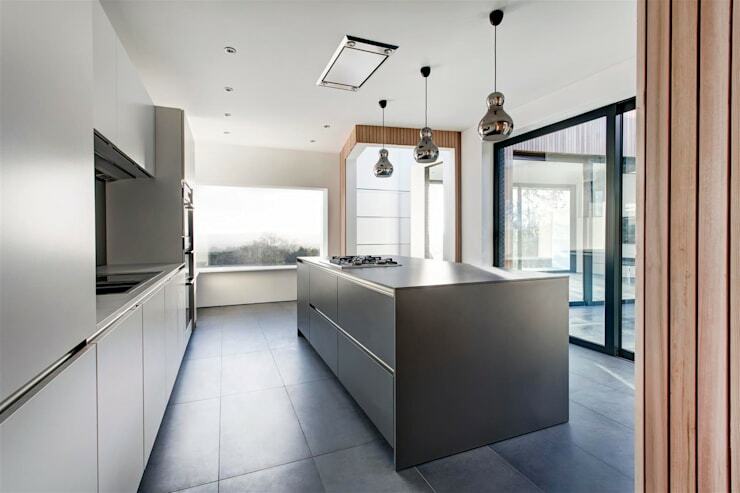 The glass sliding doors on all sides also allow its' beauty to permeate through the home. It's interesting to see the contrast between the dark grey brick and bold white frame around this feature. It makes the white courtyard feel ethereal. Here in the dining room we get a good sense of how the aesthetics of the Zen garden really interact with the surrounding living spaces. Directly to the right we also have a glimpse of the stunning views to the rear. 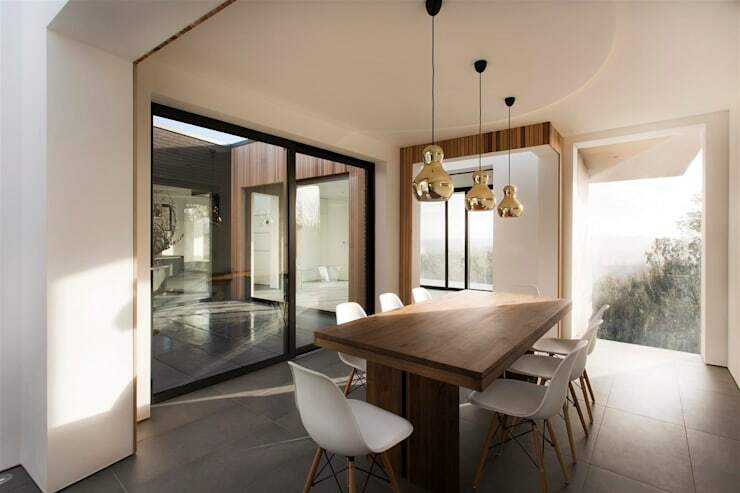 A wooden dining table and simple fittings make the room feel peaceful and calming. In the evening, small ground lights illuminate the courtyard and give the home a more somber feel. 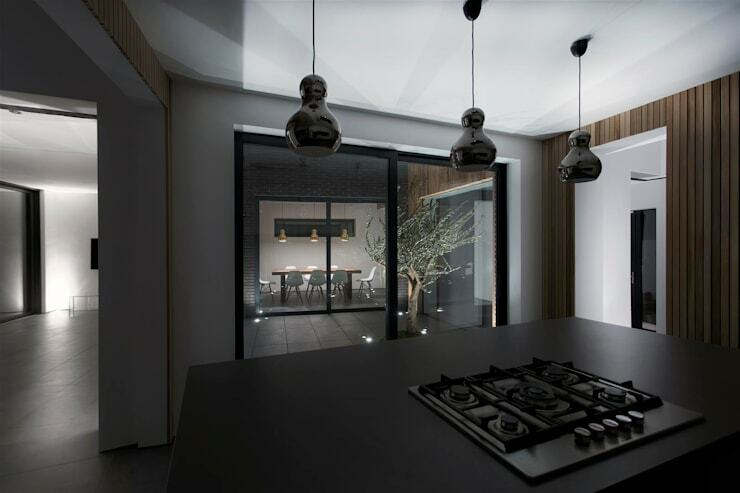 The kitchen is minimalist and black, so it blends well with the monochrome theme running throughout the home. 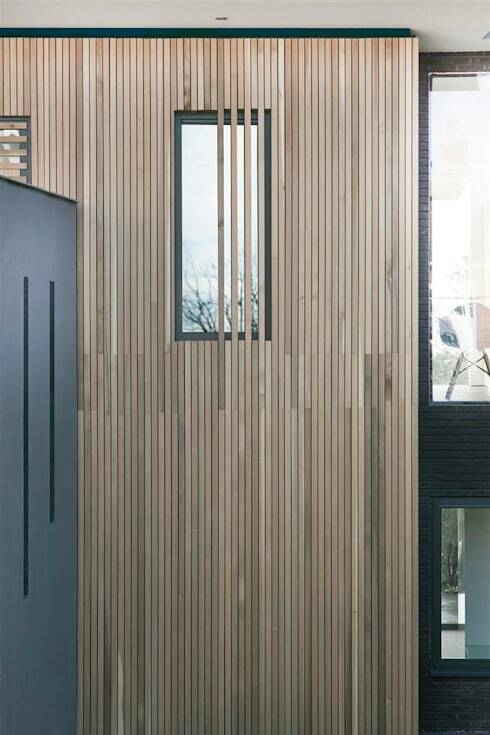 It's interesting to see how the cedar panels pop up on various feature walls to provide a sense of natural calm. Wood is, of course, a good accompaniment to a monochromatic theme. The rear of the property has stunning, far reaching views of the area. 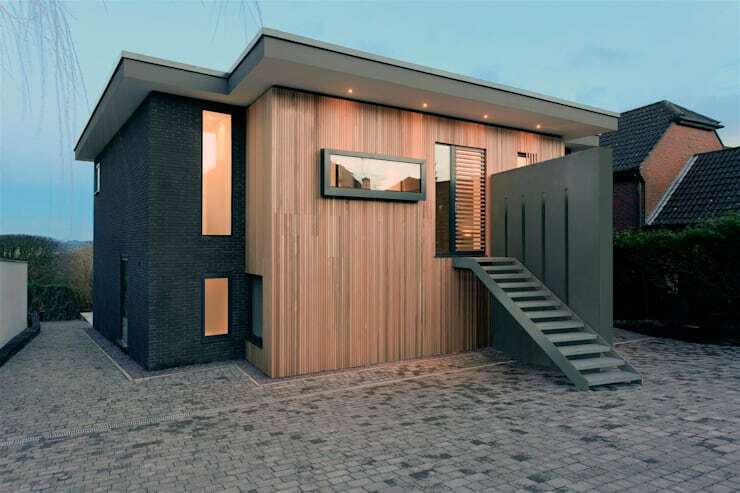 The architects wanted to make the most of this by minimising the barrier between the internal and external living spaces. 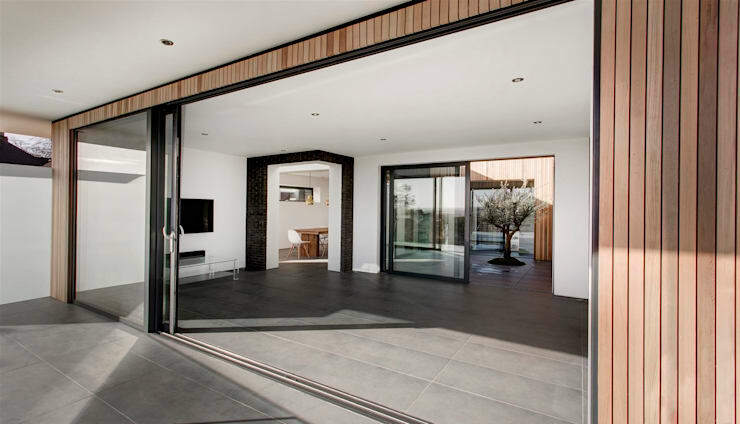 Here they have done that through using bifolding doors. Of course, a connection to nature is often cited as being of positive benefit for body and soul. This is, primarily a home for healing. Incidentally, the home has three separate views of the surroundings and an interior view of the private garden. This prompted the creators to call this home '4 views'. Our explorations of this home so far have largely been confined to the upper level. This level has those far reaching views and a more public feel. In contrast, the lower level we see here has been furnished with a darker decor. This area is used as a more private retreat for the family. If you love courtyard gardens, have a look at A modern Japanese home built for a simple life. What do you think of the beauty in this design?